The PowerEdge T710 is a 2-socket, Intel processor-based tower server that offers remote sites, large business units and growing businesses robust virtualization and server consolidation features, outstanding scalability and advanced systems management. The PowerEdge T710 is designed to be quiet, compact and easy to use, yet not compromise on performance or value. Designed to take advantage of the Intel Xeon 5500/5600 series multi-core CPUs, the Poweredge T710 tower server does well in space-constrained environments such as small offices or cramped workspaces. The PowerEdge T710 finds its strengths in various business roles from domain controllers and email servers to file and print server applications. Building on the dependability and reliability of previous generations, the PowerEdge T710 features more horsepower, storage and greater flexibility than ever before. 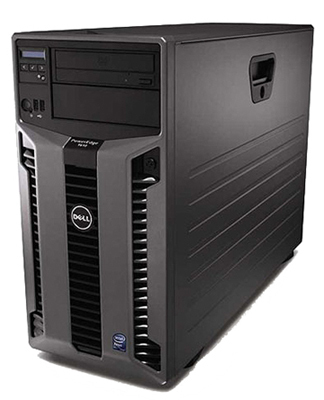 Like previous server generations, the PowerEdge T710 features a multitude of configuration options including up to two (2) Intel Xeon quad or six-core 5500 or 5600 series processors, up to 288GB RAM and two chassis styles for up to sixteen (16) 2.5" hard drives or eight (8) 3.5" hard drives. It also includes two (2) embedded dual-port Gigabit NIC ports, redundant power supplies and six (6) PCI Express Gen 2 slots. Choose a pre-configured system below or Flagship Technologies can build a custom server configuration based on the needs of your current IT project or datacenter. If you're looking for replacement/spare parts for the Dell PowerEdge T710, please select a category below.